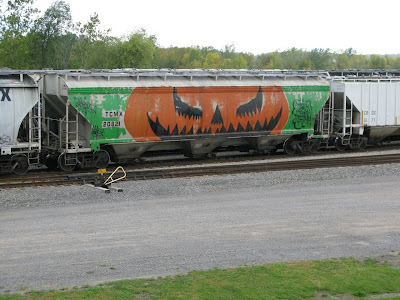 Normally I hate, hate , hate graffiti on railroad equipment, but I have to admit that this seasonal one even made me smile. The Center-Flow hopper doesn't take a pumpkin too badly. Picked this off trainorders today, it happened in Dec 2007 but the link to the story is still active. 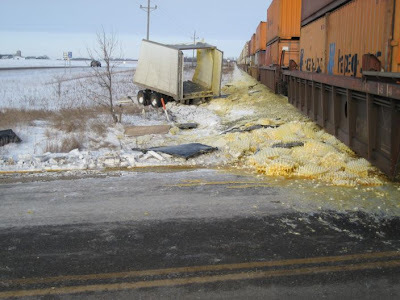 Thousands of eggs were casualties when a Canadian Pacific Train collided with a semi around 8:15 a.m. Friday about 1 mile north of Barrett. 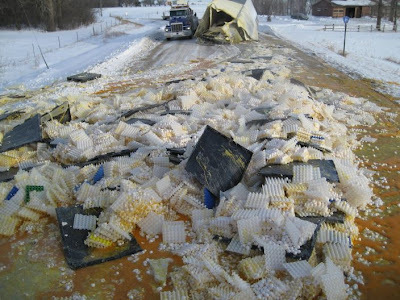 The north-bound train struck the egg-filled semi, driven by Timothy Joseph Nager, 28, Danvers, at the intersection of Grant County Road 21 and State Highway 55. 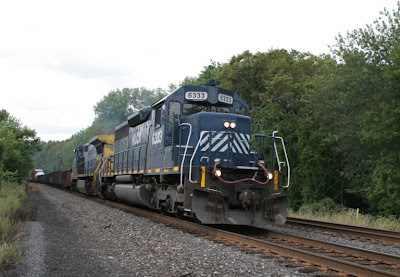 Nager crossed the train track from the south after turning off Highway 55 when the train struck the rear of the semi, tearing off the back portion, Grant County Sheriff Dwight Walvatne said. Debris was scattered throughout the intersection and down the tracks but no rail cars derailed. Neither Nager nor his passenger were hurt. Traffic was rerouted off County Road 21 to allow for clean-up. Nager was cited for failure to stop. Barrett and Elbow Lake fire departments, ELEAH Ambulance and Grant County Sheriff’s Department responded to the scene. 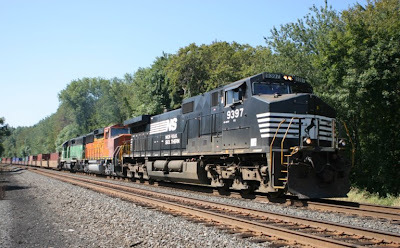 NORFOLK, VA. – Norfolk Southern Corporation (NYSE: NSC) has issued its first sustainability report, describing the company’s commitment to responsible economic, environmental, and social performance. The report, which the company plans to issue annually, is posted on Norfolk Southern’s environmental Web site at www.nscorp.com/footprints. 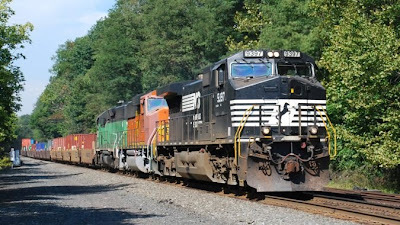 Through narrative, metrics, and profiles of employees who are making a difference, the 56-page report documents Norfolk Southern’s sustainability progress. Its content is modeled after the sustainability reporting guidelines of the Global Reporting Initiative. We cordially invite you to join us on Wednesday, Oct. 22, 2008, at 9 a.m. EDT to review our third-quarter results. We expect to issue earnings results after market close on Tuesday, Oct. 21, 2008. For those interested in participating, we will broadcast via teleconference that will be available by dialing 877-869-3847 (domestic) or 201-689-8261 (international) several minutes prior to the start of the call. At the conclusion of the event, you may listen to an audio replay, which will be available until Oct. 29, 2008. The replay numbers are 877-660-6853 (domestic) or 201-612-7415 (international) and the access code is 292821 for both numbers. In conjunction with the call, a live webcast will be accessible and presentation materials will be posted on the company's web site at www.nscorp.com under the Investors section. Following the earnings call, an Internet replay of the presentation will be archived on the company’s web site. In addition, the replay will be available for download to a portable audio player or computer as a MP3 - or podcast - file. 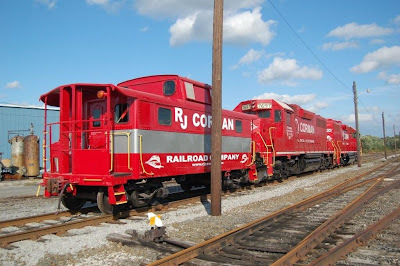 Both the replay and MP3 file can be found at www.nscorp.com in the Investors section. 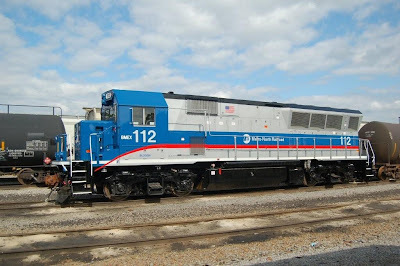 NORFOLK, VA. – Michael D. Lockhart, chairman, president, and chief executive officer of Armstrong World Industries Inc., has been elected a director of Norfolk Southern Corporation (NYSE: NSC), Chairman and CEO Wick Moorman announced today. Lockhart joined Armstrong in 2000. Prior to that, he was chairman and chief executive officer of General Signal Corporation from 1995 until it was acquired in 1998. He joined General Signal as president and chief operating officer in 1994. From 1981 until 1994, Lockhart worked for General Electric Company in various executive capacities in GE Capital, GE Transportation Systems, and GE Aircraft Engines. Lockhart holds a master’s degree from the University of Chicago, Graduate School of Business. Note: click on image to see picture enlarged. 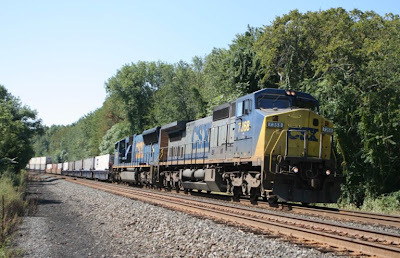 Note: this last photo is the same train shown in the posting below, NS 24V. Thanks to a heads-up from a friend via the Internet, I was told that NS 24V would have a BNSF unit trailing on Sunday's train. His information was incorrect as there was not one but two BNSF units to form this trio of 24V's motive power. NS 9397 was the leader, followed by BNSF 112 and BNSF 3021 as it passed by the Landsdown Road grade crossing around 11:12. BNSF 3021 was still wearing the BN green and black paint scheme. After 24V had passed by, I heard on my scanner that BR&W's 752 was working down at Three Bridges. That would be my next stop on today's travels. While waiting for 752 to clear Three Bridges Main Street crossing with its cut of cars, I noticed that an informational sign had been placed near the grade crossing. 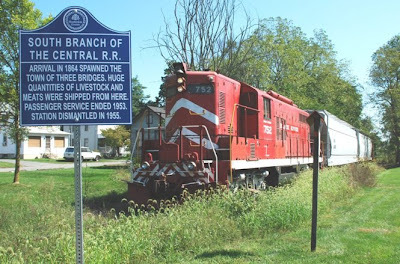 It mentioned the historical significance of BR&W's line through town. Had to wonder how many motorists have noticed this sign while waiting for the train to pass.All in all, not a bad way to end this day of being trackside. Received the following via email from Kermit Geary, Jr. on Saturday, 9-20-08. Photos, captions, and text are his. 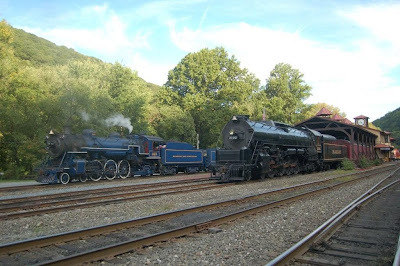 Today the Reading & Northern celebrated its 25th Anniversary. 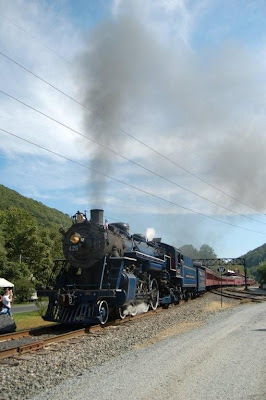 Founded in 1983, the railroad grew from a small shortline running from Hamburg, PA to Temple, PA. Today it is a major player with over 300 route miles of trackage covering most of Eastern Pennsylvania. Serving the Anthracite Region over former Reading RR trackage...and Wyoming Valley over former Lehigh Valley rails, Andy Mueller has built an empire that most people thought could never be achieved. Today the Railroad celebrated its 25th birthday with a party for guests, employees, and friends of the railroad. Happy Birthday, Reading & Northern, and here is to at least a hundred more! A 22-year-old Green Brook man was in good condition Thursday, Oct. 23 at Robert Wood Johnson University Hospital in New Brunswick after his foot was pinned under a train and nearly amputated, authorities said. Police Lt. John Crater said the incident occurred when Kason Farnella and his friend, Denny Waldron, 21, of Manville, were walking along railroad tracks near the intersection of North Street and North Seventh Avenue at about around 2:37 a.m. Friday, Oct. 17. 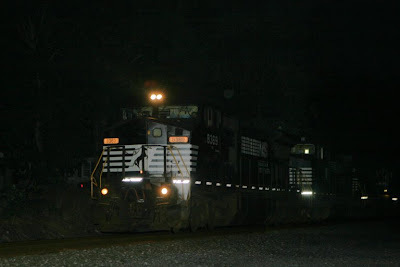 As a slow-moving freight train along the Norfolk-Southern rail line approached the men, Farnella attempted to climb onto a step of the rail car. His foot then slipped off the step, and Farnella became caught under the train, police said. Crater said Farnella told police he had been drinking alcohol before the incident. Both Farnella and Waldron are facing criminal trespassing charges by Norfolk Southern police, Crater said. 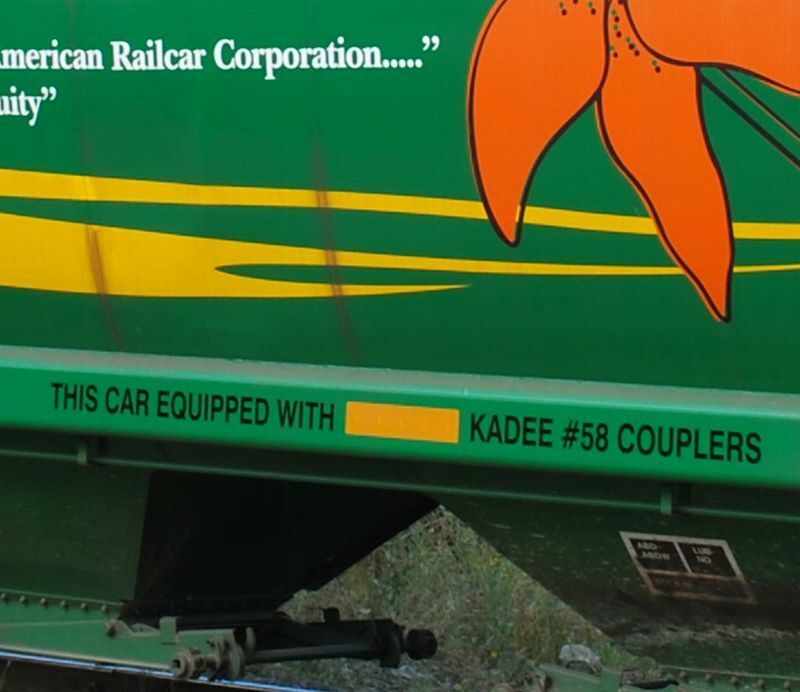 Real Trains equipped with kadee couplers??? 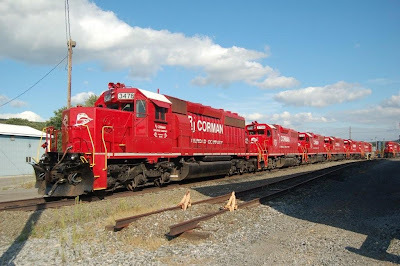 Attention all N Modelers: since the first announcement of the Hawker Siddeley Saskatchewan Grain Car, North American Railcar Corporation (NAR Corp) has said that there would be 12 CN-assigned road numbers and 12 CP-assigned road numbers. In addition to these cars, there would be a Special 25th Car which would be made available to those customers who ordered a minimum of 12 cars. Well, that 25th car is now traveling the rails somewhere in North America. 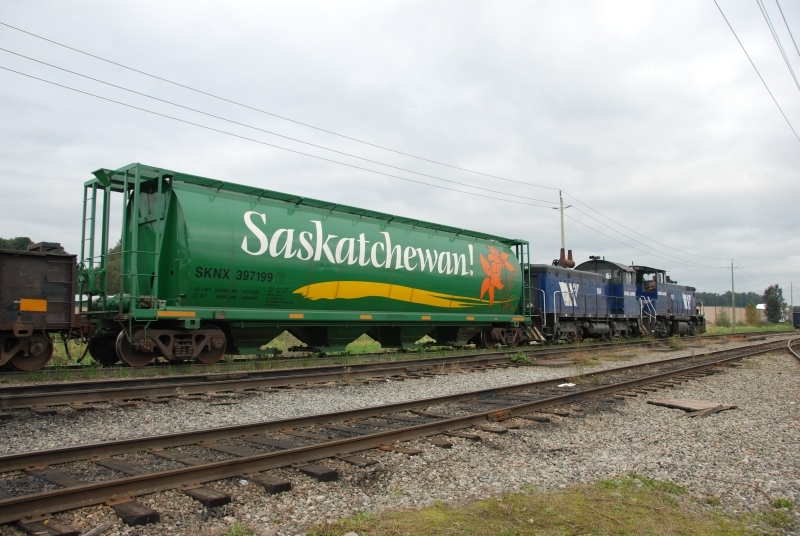 Here is the story: "How Car SKNX #397199 Came to be the 25th Car"
Pacific Western Rail Systems (PWRS), the parent company of North American Railcar Corp., was offered an exclusive arrangement with the Saskatchewan Grain Car Corporation that we felt we couldn’t pass up. 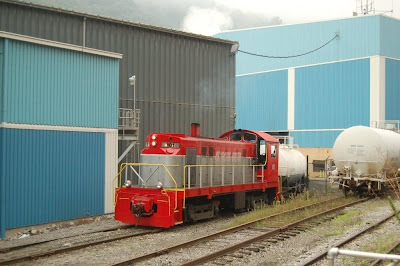 If PWRS produced an accurate model of the Hawker Siddeley Cylindrical Hopper car, we would have exclusive rights to the current paint scheme, as well as any new schemes. This gave us the opportunity and incentive to produce a very accurate, highly detailed model of the HS version of the “Canadian” 4550 Cu Ft 4-bay covered hopper. We at PWRS are very proud of our new SGCC Four Bay 4550 cu ft Cylindrical Hopper car due for release in early December and rightly so. 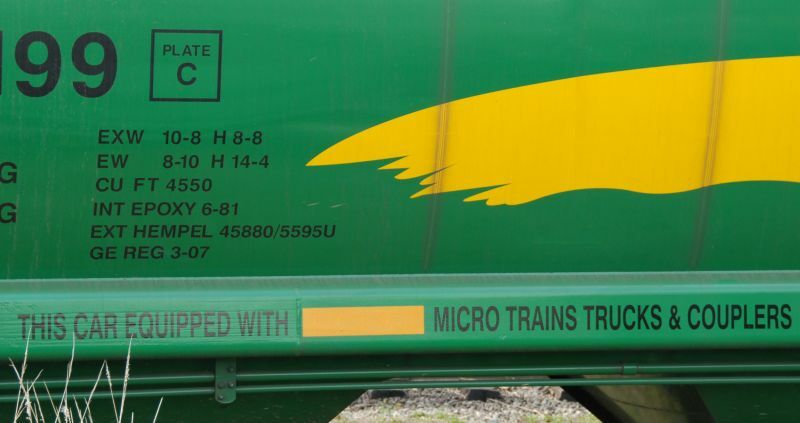 It represents the most colorful paint schemes on any 4 bay cylindrical hopper car anywhere. On September 27th NAR Corp got word that one of these beautiful cars was spotted in Abbotsford, British Columbia - not far from our warehouse and it was looking a little worse for wear (it had been ridden hard and put away dirty). So what else would a company with pride in their product (or model there of) do but go out and give it some TLC to spruce it up. 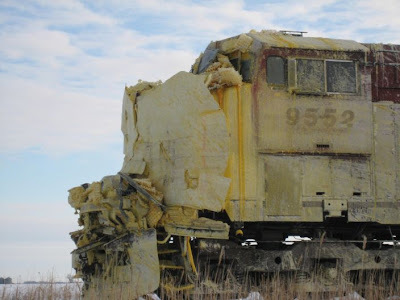 We contacted the Southern Railway of British Columbia, and they were kind enough to move this particular hopper to a location where we could clean up this soon to be Special 25th Car. The first thing that we had to do was to clean several thousands of miles of dirt off the car. Fortunately we came prepared to do the job! A couple of very dedicated employees with the help of alot of Windex got the job done. With a clean palette, we could now create the Special 25th Car saluting the Model Railroading Industry. 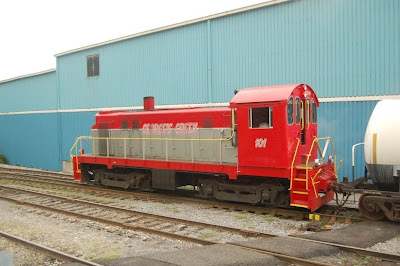 North American Railcar Corporation, with our commitment to "Accuracy and Detail in Scale", firmly believes that art should accurately imitate life. With our Special 25th Car, we wanted to make life accurately imitate art. 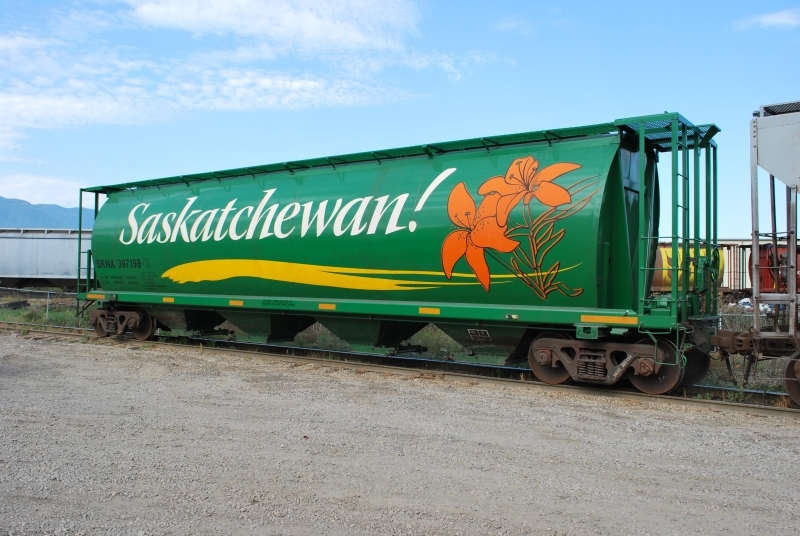 N.B., All the graphics that were added to this car had the full permission and blessing of Kadee, Micro-Trains and the Saskatchewan Grain Car Corporation. We hope you will join with us in thanking Kadee, Micro-Trains, SGCC and Southern Railway of BC for their help and support in making this Special 25th Car a reality. The following article appeared in the Courier News on September 25, 2008. Jan Kucsma, owner of the Big Little Railroad Shop, has an easygoing manner pointing out the pint-sized trains, tracks, pieces of scenery and other items on the shelves of her West Main Street business. But Kuscma gets very serious over the idea the shop's goods are cold, collectible items that the purchaser should hide away in a closet. "These are toys," Kuscma said, insistently. "Play with them." The shop has more than trains for sale, including a wide variety of models from cars and planes to military vehicles. In the back of the shop, a looping, multi-level slot car track with controllers is set up, with boxed versions for purchase nearby. Kuscma said the store will soon change its name to the Big Little Railroad Hobby Shop to reflect its broader offering. 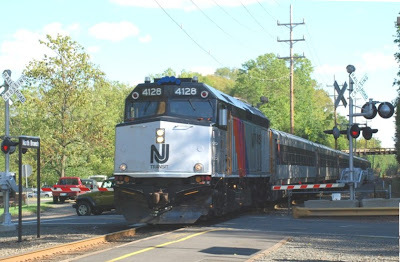 The Big Little Railroad was the nickname the Central Railroad of New Jersey gave itself, according to Kuscma, who said NJ Transit presently runs on the old railroad's line. The one thing that isn't for sale is Pennsy, a reformed "Jersey City street dog" who docilely roams the shop. On Wednesday, Sept. 17, Pennsy - whose name is short for the Pennsylvania Railroad Co. - was doing in-house advertising for the store, wearing a green shirt that read "Got Trains?" Kuscma, an avid train watcher and a leader in the local 4-H Train Masters club, said the business started in 1991. It grew out of the train hobby of her husband, Jeff Kuscma, who passed away in 2000. "I was a typical wife, and we'd talk about it and I'd say, "Oh yeah, really? Sure,"' Kuscma said about his hobby. "He passed away and I was stuck with this. So it was a real sharp learning curve. Now I think it's fun. I thoroughly enjoy it." Jeff Kuscma's picture is on the wall behind the register. "He's still looking over my shoulder," Kuscma said. Other items on the wall include a photograph of soldiers in Iraq enjoying a train set that included donated equipment from the store. Trains which the store sells come in different scales from companies such as Lionel, Atlas, Athearn, Kadee and Bowser. The models often reflect the transition era for trains in the 1940s and 1950s when they were switching from steam to diesel engines along with more modern trains, Kuscma said. Model trains can allow people to flex their artistic muscles by decorating the tracks' surroundings, build cars and train-related structures, or carry their interest in geography or history to the next level by having the set reflect a particular place and time, Kuscma said. The shop seems stocked with much of what a serious train enthusiast could want - and items it doesn't have are just a phone call away - but its appeal is broader than that. "People are attracted by the trains in the window, and then they come in to see what we have, and we have things for people other than trains," said Kucsma, who paused for second before adding, "And then they all come in to see the dog too." 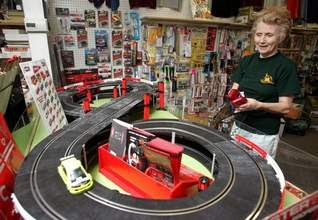 Jan Kucsma demonstrates the new slot cars that she carries at her store, the Big Little Railroad Shop on West Main Street in Somerville. On Sunday, October 5, 2008, from 11 AM to 5 PM, Main Street in Somerville, NJ will be turned into a pedestrian mall. Stores will be open, there will be vendors of all sorts, and there will be entertainment. The weather should be a beautiful autumn day. When you come, please be sure to visit our store, The Big Little Railroad Shop, at 63 West Main. Here is some "official information." The 21st annual event attracts a mile of vendors to Main Street at this fall celebration of the arts with a full day of non-stop music, KidZone with rides and games, and fantastic festival food favorites. Please note there are 2 accessory stages with preformances to be announced. More information can be found at the following web site. This week marks the end of the 3rd quarter of 2008. Note that the "Total Traffic" for 2008 (blue line) has been running behind 2007 (green line). If you visit the Railfax web site though, you will find that grain and coal traffic are up this year versus last. Check it out. Received the following via email on 9-18-08. 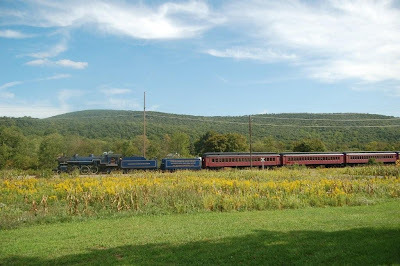 New developments in connection with the dormant, flood-ravaged segment ofthe former DL&W/EL Utica Branch between Chenango Forks and Sherburne, NY. New York State Department of Transportation has moved to halt a railroad from discontinuing service along the roughly 41 miles for track that stretches from Chenango Forks to Sherburne, N.Y., local newspapers report Ina petition filed last week, the NYSDOT requested that the Surface Transportation Board "stay the date of the [New York Susquehanna andWestern's] petition for discontinuance of service on the Utica Branch pending the resolution of the NYS&W's outstanding contractual obligations." 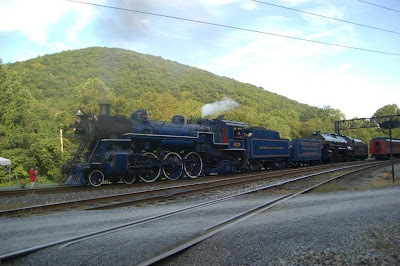 The action was taken in response to the Aug. 12 filing with the STB by the Cooperstown-based rail company seeking to discontinue service as of Oct. 1. The line, which NYS&W acquired from Conrail in 1982, has not been actively used since the track was heavily damaged in flooding more than two years ago. According to the state DOT, "since June 2006, NYS&W has made no attempt to restore the line to service and such failure violates several provisions of the various contracts." The petition cites the railroad for failing to maintain the track, not seeking the Commissioner's approval before filing the notice to discontinue service and for not making arrangements to reimbursement the NYSDOT for approximately $1.29 million in project costs. The railway currently has 13 contracts (six for "track and structure rehabilitation" and seven for "highway/railroad structure rehabilitation") open with the NYSDOT related to the Utica Branch, which includes the stretch of track along which they are seeking to discontinue use. These contracts total more than $13 million in taxpayer dollars. Received the following from Kermit Geary, Jr. dated 9-18-08. Pictures and text are his. Finally headed for home. After touring the southeast between Gustov and Ike, I managed to get into some interesting areas, I meet with lots of good people and saw some neat railroad operations. 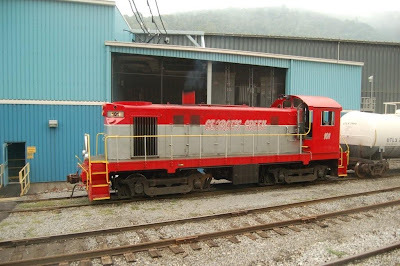 The last stop on my tour was the Georges Creek RR which operates this ALCO T-6 in Luke, MD. Ex PRR 8427 (as built), this unit has lead a rough and varied life before finally finding a good home here. 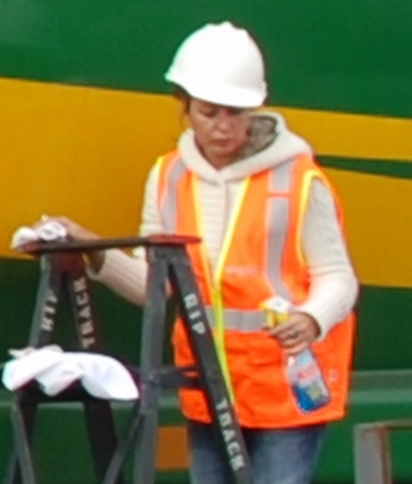 And here as through out the trip, the management and crews were very friendly and helpful. Thanks for travelling (photographically that is) with me. I hope y'all enjoyed the ride!! Received the following from Kermit Geary, Jr. dated 9-18-08. Pictures, text, and captions are his. Spent a day looking at the remains of the Knox & Kane...sad to see the damage that the arsonist did when it torched the engine house in Kane, PA. Hope that someone comes forward and identifies the idiot, so they can string him up by his toes. 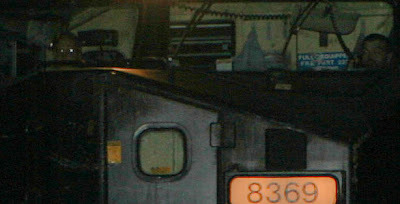 visited a couple of shortlines on the way back, on the B&P in DuBois, I found the latest creation from Brookville Locomotive Works headed for Metro North...and the entire roster of RJ Corman's Clearfield Lines at the engine facility in Clearfield, PA.
RJ Corman's fleet at Clearfield, PA all units were just recently painted. 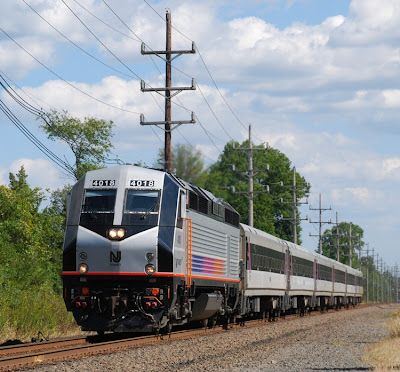 would find three golden opportunities to photograph NJT's afternoon westbound trains along the Raritan Valley Line. 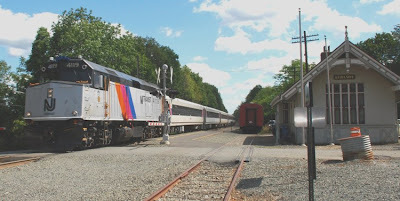 The first train was NJT 5721 which was slowing to a stop in Lebanon to let one passenger get off around 12:23. Two hours later would find me standing east of MP 42.2. A more familiar name for this location would be the Ridge Road grade crossing as Train 5725 heads west with its consist in tow. It's next stop will be Whitehouse Station.